Our knife guards are made of ¼“ thick heavy-duty polymer with a magnetic strip to hold the guard securely in place. 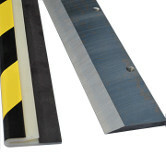 A black and yellow safety stripe is added for increased visibility.Use these knife guards for protection during all non-production work and storage in your shop. Note: Not intended for shipping protection. Use a knife board when you need to transport your knife. This 12" knife guard is made of ¼“ thick heavy-duty polymer, and measures 2½“ tall by 12" long. Use it for protection during all non-production work. This 13" knife guard is made of ¼“ thick heavy-duty polymer, and measures 2 ½“ tall by 13" long. Use it for protection during all non-production work. This 13.5" knife guard is made of ¼“ thick heavy-duty polymer, and measures 2½“ tall by 13½" long. Use it for protection during all non-production work. This 14" knife guard is made of ¼“ thick heavy-duty polymer, and measures 2½“ tall by 14" long. Use it for protection during all non-production work. This 14.5" knife guard is made of ¼“ thick heavy-duty polymer, and measures 2½“ tall by 14½" long. Use it for protection during all non-production work. This 15" knife guard is made of ¼“ thick heavy-duty polymer, and measures 2½“ tall by 15" long. Use it for protection during all non-production work. This 16" knife guard is made of ¼“ thick heavy-duty polymer, and measures 2½“ tall by 16" long. Use it for protection during all non-production work. This 16.5" knife guard is made of ¼“ thick heavy-duty polymer, and measures 2½“ tall by 16½" long. Use it for protection during all non-production work. This 17" knife guard is made of ¼“ thick heavy-duty polymer, and measures 2½“ tall by 17" long. Use it for protection during all non-production work. This 17.5" knife guard is made of ¼“ thick heavy-duty polymer, and measures 2½“ tall by 17½" long. Use it for protection during all non-production work. This 18" knife guard is made of ¼“ thick heavy-duty polymer, and measures 2½“ tall by 18" long. Use it for protection during all non-production work. This 19" knife guard is made of ¼“ thick heavy-duty polymer, and measures 2½“ tall by 19" long. Use it for protection during all non-production work. This 21" knife guard is made of ¼“ thick heavy-duty polymer, and measures 2½“ tall by 21" long. Use it for protection during all non-production work. This 22" knife guard is made of ¼“ thick heavy-duty polymer, and measures 2½“ tall by 22" long. Use it for protection during all non-production work. This 22.5" knife guard is made of ¼“ thick heavy-duty polymer, and measures 2½“ tall by 22½" long. Use it for protection during all non-production work. This 23" knife guard is made of ¼“ thick heavy-duty polymer, and measures 2½“ tall by 23" long. Use it for protection during all non-production work. This 23.5" knife guard is made of ¼“ thick heavy-duty polymer, and measures 2½“ tall by 23½" long. Use it for protection during all non-production work. This 24" knife guard is made of ¼“ thick heavy-duty polymer, and measures 2½“ tall by 24" long. Use it for protection during all non-production work.